When I was a little girl I was always excited to pull the minnow trap up from the end of the dock to see what oddities I had caught accidentally while trying to trap minnows. I am reliving this excitement on a much larger scale on this research cruise. The dredge we are using to fish for ocean quahogs and surfclams is 5ft x 20ft, weighs 2500lbs, and is pulled for ¼ nautical mile each time it is towed. (That means it covers an area of about 9000 square feet.) As you might imagine it accidentally catches things besides the ocean quahogs and the surfclams that we are fishing for. The dredge is lowered into the water off the back of the ship. Once it hits the ocean floor a powerful jet of water is sprayed into the ocean floor in front of it to “liquefy” the sand or mud on the ocean bottom. This loosens the clams and suspends them in the water, just above the bottom. (Ocean quahogs and surfclams aren’t far below the bottom; just a few inches.) Then, while they are suspended in the water the dredge scoops them up. The dredge is brought back up to the ship and dumped and we sort through the catch. 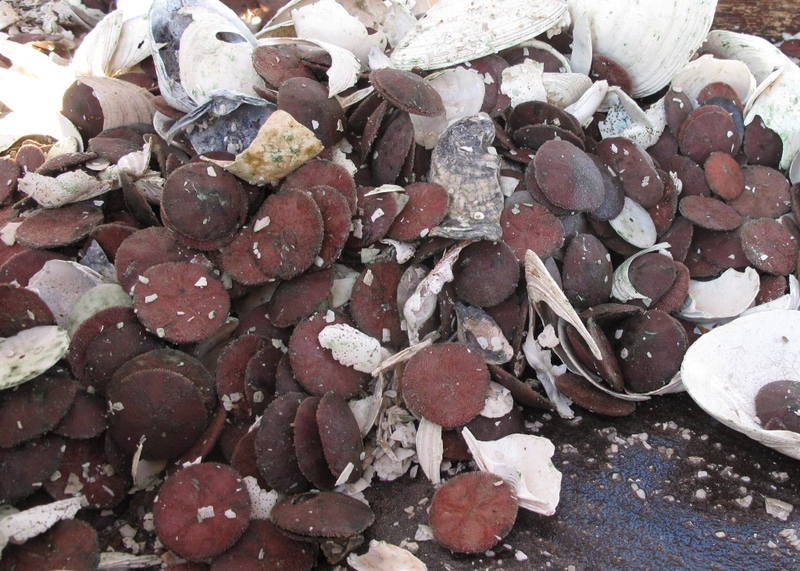 The ocean quahogs, surfclams, and a few other species are kept to weigh and measure. Below is a video of the dredge being hauled back on the back deck of the ship. After three watches I am getting pretty good at identifying ocean quahogs and surfclams. What is the difference between an Atlantic surfclam and an ocean quahog? Well, they are very similar! They are both bi-valve mollusks, which means that they have two shells covering a soft body. They both burrow into the sand so that only their siphon sticks out. Both of them filter their food, algae and plankton, through their siphon. One of the biggest differences between them is in the way that their shells connect, or hinge together. Another difference is their lifespan. The ocean quahog lives for more than 150 years and the Atlantic surfclam lives for approximately 30 years. Their size and shape are different too. Ocean quahogs are rounder than the Atlantic surfclams, which have a triangular shape. 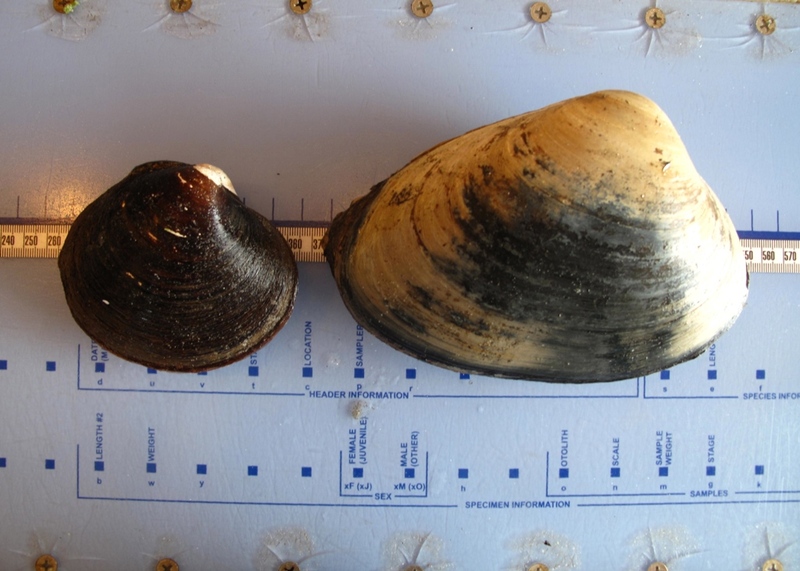 The Atlantic surfclam also grows larger than the ocean quahog. Just like I was excited as a kid to find crayfish and bullheads in my minnow trap I am excited to see what the dredge brings up each time. So far our biggest catch was 4400 quahogs! Conversely, our smallest catch was just three quahogs! Sometimes the dredge is filled with empty shells, or empty shells and sand dollars, or thousands of clams, or sometimes it is really sandy. Each time it is a surprise and it gives you a brief glimpse of what the bottom looks like. There are many potential dangers that you can face every day while working on a ship. In fact, since being aboard we have run three drills; man overboard, fire, and abandon ship. These drills are run on every trip so that everyone knows exactly what to do. I think that there is something about being at sea on a ship that heightens your awareness of yourself. I have experienced that same sort of feeling when I am sea-kayaking in big water, or hiking on a bear trail. It is the feeling that there is something out there that is bigger than you are. You sense things in a much clearer and acute way. This evening the sun was going down on the starboard side of the ship and the moon was coming up on the portside. We could see for miles and miles. Earlier today we watched a school of tuna swim past and dolphins in the distance. It was a beautiful clear and sunny day and we were 140 miles from land. We are lucky. The clams and quahogs are collected on this research cruise from the sea floor using a hydraulic dredge. The dredge is lowered and run along the seafloor for about 5 minutes in order to pick up the clams and quahogs. Each time this is done it is called a “tow.” How many people do you think are needed to conduct (operate the machinery and collect the data) one tow for clams and quahogs? How many different jobs are there during one tow? 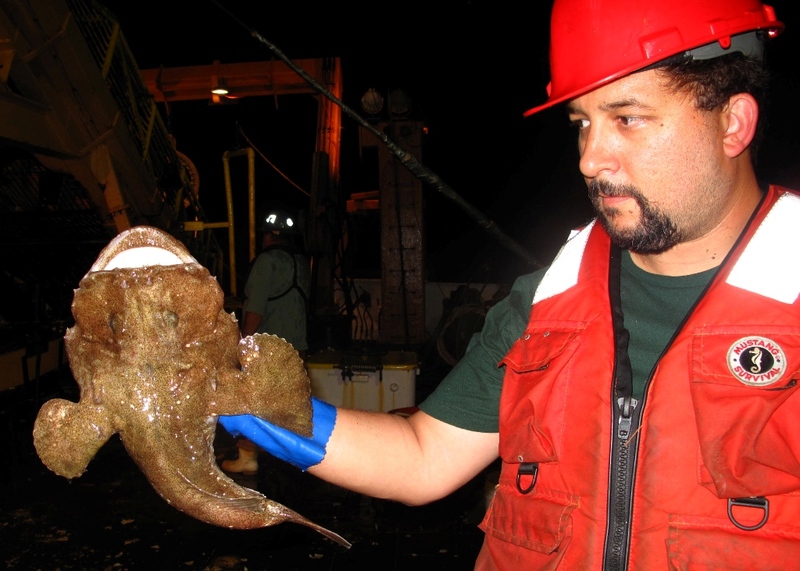 This entry was posted in 2011, Jessie Soder, NOAA, NOAA Fisheries Service, NOAA Teacher at Sea and tagged Atlantic Ocean, dredge, monkfish, ocean quahog, sand dollars, scallops, surfclam. Bookmark the permalink. I had no idea a quahog could live so long! Amazing! Glad you are having good weather and finding lots of interesting critters on the sea floor.